The launch phase is a critical point in a hotel life cycle that can dramatically impact the long-term outlook of the business. Minimal base occupancy can impact rates on a long-term basis and raising brand awareness is costly, especially if you're aiming to reach global markets. To kick-start your launch, look no further than Luxury Escapes. For its members, Luxury Escapes offers great deals to amazing places at insider prices. For its partners, it provides unparalleled marketing reach, demand generation and profitability. With a growing and affluent member base of 2.6 million, Luxury Escapes offers a trusted platform through which to launch your property. This members-only audience is hungry for holiday inspiration, new destinations and new experiences, with 95% purchasing packages for destinations they had never originally intended to visit. We put your hotel in lights: Carefully-curated, award-winning content is leveraged to support hotel partners both through initial launch and beyond. 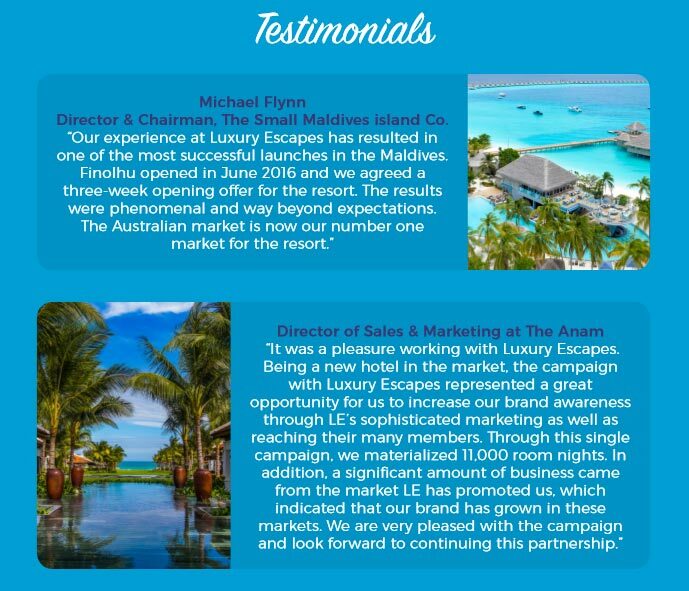 Luxury Escapes connects you with these customers through unparalleled marketing with a high impact, bespoke campaign, at no cost to you. Kickstart your opening today with Luxury Escapes. With a global partnership team ready to connect, there's no better time to start a conversation.